A little bit of fringe goes a long way on this exotic beauty! 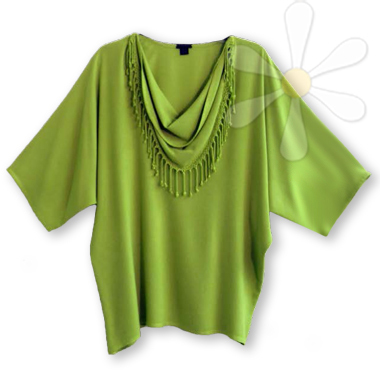 It's up-front feature is an insert at the neckline of extra fabric that's tinged with fringe! A basic tunic shape with plenty of room for your shape... adorable! This delicious free size top is woven and dyed in Morocco of 65% cotton and 35% rayon susti, which means it's yummy soft AND durable -- the highlight of all our garments.